Not all of our featured fossils are particularly beautiful, or even entire, but they are interesting in some way. 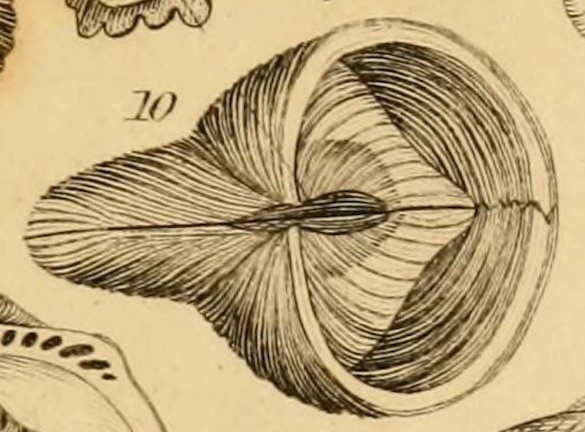 Above is the broken cross-section of a rostroconch mollusk known as Hippocardia Brown, 1843. It was found somewhere in Ohio by the late Keith Maneese and kindly donated to the department by his widow Cameron Maneese. 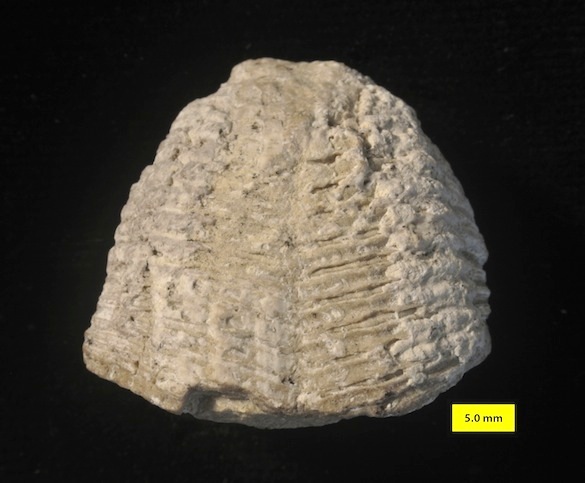 From its preservation and the kind of rock making up the matrix inside, we can tell that it almost certainly came from the Columbus Limestone (Middle Devonian, Eifelian). 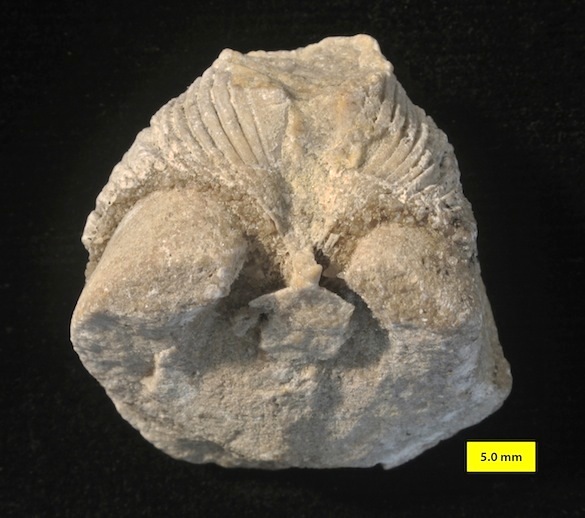 In the top image it is apparent that this fossil has bilateral symmetry, a heart-shaped cross-section, and a ribbed calcitic shell. This is the dorsal view. Flipping the specimen upside-down, we now have a view of the ventral portion. Again we see the ribs and bilateral symmetry. Captain Thomas Brown (1785-1862) named the genus Hippocardia in 1843. He was a Scottish naturalist who studied many topics, including mollusks. Above are the sections of his book The Elements of Fossil Conchology that describe and illustrate Hippocardia (considering it a bivalve). Captain Brown was born in Perth and went to school in Edinburgh. He joined the militia at 20, becoming a captain at 26. When he was transferred to Manchester, England, Brown acquired an interest in nature. He bought a flax mill after leaving the military, but it burned down while still uninsured. He thus turned to nature writing for support. He was became a Fellow of the Royal Society of Edinburgh in 1818, and in 1840 he was appointed curator of the Manchester Museum. He retained this position for the rest of his life. He was later a Fellow of the Linnean Society and a member, in classic 19th Century fashion, of several other groups, including the Wernerian, Kirwanian and Phrenological Societies. (I love the addition of phrenology to his interests!) The marine gastropod Zebina browniana d’Orbigny, 1842, was named after him. An interesting character, this Captain Brown, but I’ve been unable to find a single portrait of him. Brown, T. 1843. The elements of fossil conchology according to the arrangement of Lamarck; with the newly established genera of other authors. Houlston & Stoneman, London; 133 pages. Hoare, R.D. 1989. 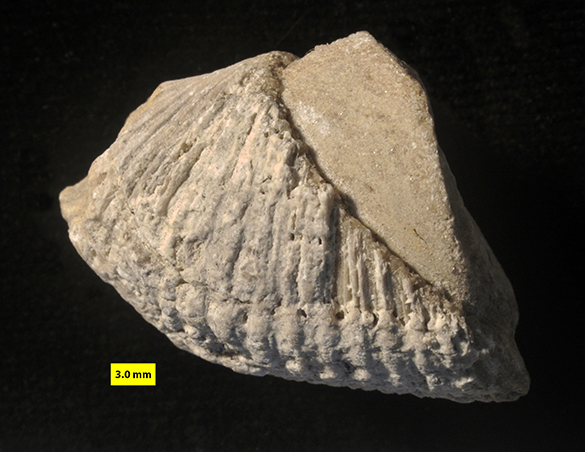 Taxonomy and paleoecology of Devonian rostroconch mollusks from Ohio. Journal of Paleontology 63: 838-846. Pojeta, J., Jr., Runnegar, B. 1976. 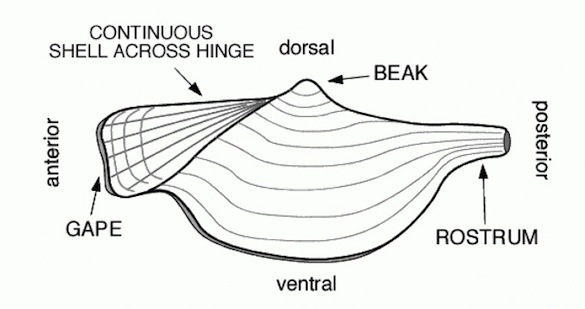 The paleontology of rostroconch mollusks and the early history of the phylum Mollusca. United States Geological Survey Professional Paper 968: 1-88. Pojeta, J., Jr., Runnegar, B., Morris, N.J. and Newell, N.D. 1972. Rostroconchia: a new class of bivalved mollusks. Science 177: 264-267. Runnegar, B., Goodhart, C.B. and Yochelson, E.L. 1978. Origin and evolution of the Class Rostroconchia [and discussion]. Philosophical Transactions of the Royal Society B: Biological Sciences 284(1001): 319-333. Wagner, P.J. 1997. Patterns of morphologic diversification among the Rostroconchia. Paleobiology 23: 115-150.